Ohhh dinner. I can’t even take you. We have, like noodles… covered in even more starch. It’s fabulous. It’s creamy. It’s sort of sweet but in that really realllllly good way. And a bit cheesy too. Basically everything I want in life besides a little bacon sprinkled on top. I’m on a biiiiiig sweet potato kick right now. Oh! And the green stuff? Yeah. I know. Weird. Fancy meeting you here. But if you remember, kale falls into the category of about three vegetables I can stand. Which makes me and my life even weirder. And I’m obsessed with roasting it after it’s been smothered with toasted sesame oil, which I took from that amazing coconut kale salad of Heidi’s that I’ve been eating at least once a week for well over 6 months. As the only dish that’s successfully made me consume kale in a way other than chip form, I bow down to the combination. And now… smashed in between these sweet potato-quenched noodles, it’s just like… the best flavor marriage EVER. A complete happy accident. I’m now the weirdest. But at least dinner is served. We definitely deserve chocolate after all of those vegetables. I like the way you think. I’ve been on a biiiiig sweet potato kick for like the last 4 years of my life. True story. You had me at hello with this. I absolutely love sweet potatoes – with cheese, pasta, kale? Unique and delicious-looking. I’m making this tomorrow night. Thanks! Yuuum!!! 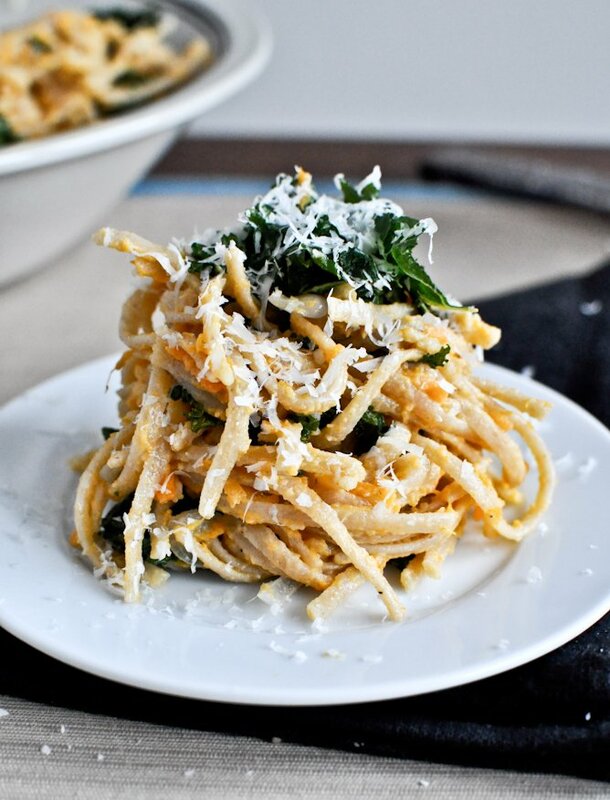 Pasta + sweet potato + kale sounds incredible! I am in serious need of this pasta! Thank goodness I have the ingredients! jessica, i don’t even really enjoy pasta all that much (i know, i’m so weird) but i literally want to jump through the screen and take a bite out of that last picture. this looks incredible! i’m a sucker for sweet potato anything! Not so weird – I hated pasta for at least the first half of my life! I enjoy it now but it’s never my first choice. People think I’m nutssss. Oh this is so me! Looks incredible Jessica! As for the sesame oil, the stuff is just from heaven! Love that stuff! It gives everything such a warm, toasted,luxurious flavor. Seriously… I could drink it! That last perfect bite that has everything on top! Yum! oh I’m loving this idea! Maybe that will be a way I enjoy roasted kale?? I love sweet potatoes and kale too! I posted a stuffed sweet potato with kale and pancetta recipe today. What a coincidence! I can’t wait to give your recipe a try! This looks good! It’s fend for yourself night, and I know what I’m making! I can’t wait to try this!! It looks simply amazing!! HA! I love it..basically noodles covered in my starch. :) Perfect. My starch… heh heh heh. I just so happen to have almost all of these ingredients in my house right now. Coincidence? ;) I can’t believe I’ve never thought to make a sweet potato sauce before. You’re a clever lady! Sweet potatoes in pasta? Sign me up? Topped with crispy kale? I’ll take seconds please. And don’t forget to pass that chocolate by me! Btw, Heidi’s coconut kale is SOOO darned good – I even got the husband to eat it! It’s a regular in this house, too. so simple and yet looks sooo delicious!! Do you have any left?? I am not a pasta girl at all, but these flavor combos look incredible! This looks so good! I never would have thought to top pasta with crispy kale. Ingenious!!!! I don’t have sweet potato right now, but I do have pumpkin. Do you think that would work? i bet it would! i make a pumpkin pasta sauce that’s pretty similar… yum! Looks nice and comforting! Yum! I basically only eat kale in chip form but I think this could convert me, I want this for breakfast, lunch and dinner! I’ve heard of creamy butternut squash sauces, but sweet potato is new to me. Looks delish! Come to mama. I never met a pasta I didn’t like. This is no exception. Genius!! Ok. I’m making this. But I’m adding bacon to it! Oh man,, I could eat a HUGE pile of this stuff! You may have just convinced me to try kale for the first time ever. And I have to say I will probably be putting bacon on top too haha. Rachael’s got some good ideas but this is even better if for nothing else than not having to listen to her voice! I am making this IMMEDIATELY!!! Thank you!! Love that tall nest of pasta!!! I bet this is insanely creamy…waaaant. i don’t know why but i kind of hate dinners right now…til i saw this. extra starch for me please! I am obsessed with that kale coconut salad! Even my husband, who thinks turkey bacon is an abomination, described it as “meaty.” WHAT??? I saw Rachael Ray make that crispy kale pasta and have been thinking about it ever since. I like your version better, though! Oh dear, I want this now! It may be only 9:49am but I NEED this now… Yum! This makes my mouth water, looks so good! Can’t wait to try it out! Oh that sauce…it sounds soooo good! I could get into that poured over just about anything. sweet potato kicks are a good thing. this looks amazing. kale is one of my favorites. love this! It looks so gorgeous all piled up! Did you really just take a sweet potato and make a sauce out of it? You’re my hero! And then you topped it with crispy kale? Holy heavens, we need this for dinner! You are truly a cooking/recipe developing/writing genius. Truly. Have a great week! Great Post! I have been finding I like my kale raw after massaging it. I haven’t got the guts to try that yet, but I know I should! Oh my goodness, it looks so good! Sweet potato in pasta? Must be awesome. Not so sure about the kale though… I have a Dutch background and have only ever had the stuff in ‘boerenkool’ which is a dish of potatoes, onions, carrots and kale all mashed together. I know. Totally appetizing. It’s turned me off kale completely. Should I give it a proper chance? This does look sooo good! Oh girl.. you def should. If I (who loathes all vegetables) like kale… you might just love it!